The ZenFone Zoom S from Asus is aiming for great pictures thanks to a dual camera and long battery life with its mega battery. Have they really managed to achieve this? 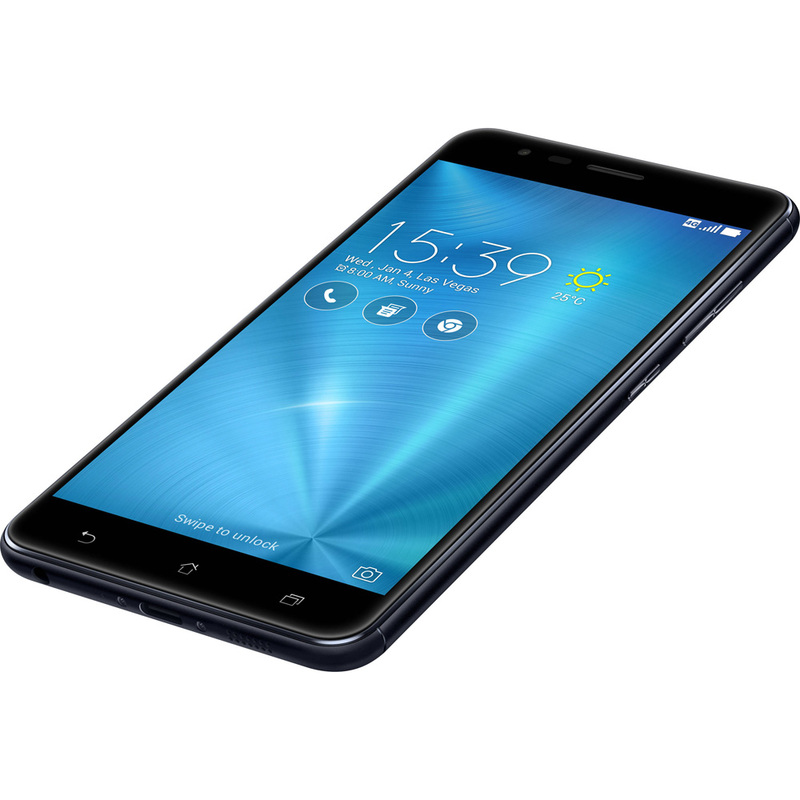 The Taiwanese manufacturer has a wide range of smartphone innovations at the moment, including the high-priced ZenFone 3 Deluxe (test in connect 7/2017). 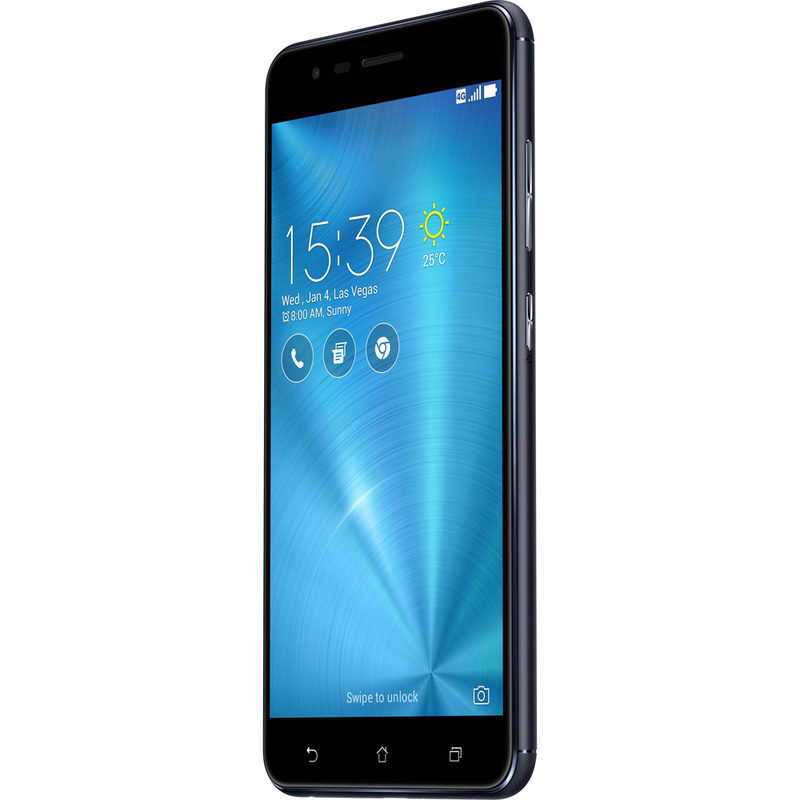 The latest model goes by the name of ZenFone Zoom S, sold abroad as the ZenFone 3 Zoom. Costing €499, it joins the ranks of the trendy models with dual cameras. What does the user get for that hefty price tag? Find out below. Optically, the ZenFone Zoom S goes for the more low-key, elegant approach in attracting potential buyers. The test device came in a black outfit with a minimal proportion of blue. Alternatively, you can choose between White and Rose Gold. The casing with its rounded edges does nothing to stand out from the masses of smartphones in this price class. The Asus is flawlessly finished and has an impressive metal reverse, although the front and bottom of the ZenFone Zoom S have a simple plastic cover. However, the display cover, made of scratch-resistant Gorilla Glass 5, feels like it has been placed on, making for a noticeable edge that does not feel very good in everyday use. Underneath resides a 5.5-inch OLED screen with a resolution of 1080 x 1920 pixels. The display has impressive contrast properties, a sharp image, and neutral colour rendering, but the latter is only the case when you select the “Standard” option under “Display colour mode” in the settings menu. The round display is completed by the high radiance of the self-luminous OLED screen of 433 cd/m2 as well as by the great display quality of content. In terms of display, it gets the green light. A Snapdragon 625 version by Qualcomm comes into action as a technical platform, offering an octa-core CPU with a maximum output of 2 GHz. The ZenFone Zoom S can draw upon 4 GB of RAM. Not only does this combination ensure a good performance for the benchmark tests, but also makes everyday use free from delays and lag. Asus shows its generous side with user storage as the test device came with 49 GB of free space.You can easily expand upon the storage via the combination slot with a micro-SD card. Alternatively, you can install a nano-SIM card in this slot, allowing you to utilise two mobile contracts. The other most important standards are on board regarding connectivity equipment, including LTE Cat.4, HSPA+, and Bluetooth 4.2. The only options missing here are NFC and quick WiFi, but on the plus side there is a modern USB-C port to charge the phone and transfer data onto a computer. The ZenFone Zoom S gave a masterful performance in the test lab, with the fitted 5000 mAh battery actually delivering in practice what it was theoretically able to. The test devices achieved an impressive battery life of 12:16 hours in display mode. This is a dream score that is only surpassed by two other smartphones at the moment on the connect leader board, proving the ZenFone Zoom S to be a real distance runner. But unfortunately, where there is light, there is often darkness. Following on from this top result is the blunder that is the wireless scores. 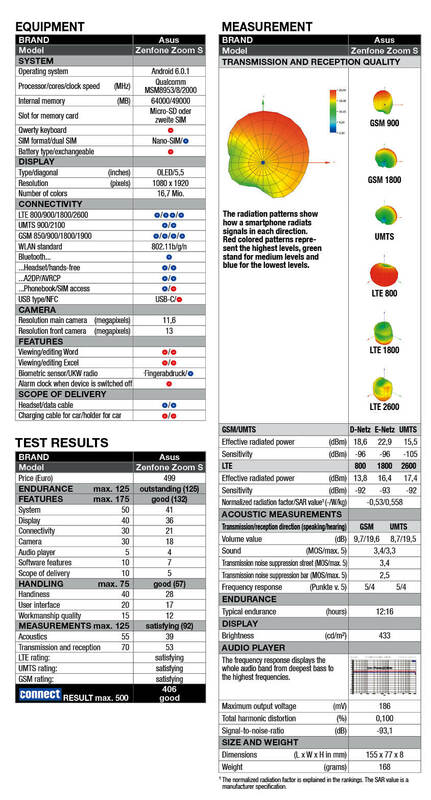 In terms of wireless quality, the Asus was only able to achieve a “satisfactory” for GMS, UMTS, and LTE. The acoustic scores were only decent as well, meaning a lot of points were disappointingly dropped along the way. The ZenFone Zoom S also makes a pretty spectacular blunder with the operating system, as Asus counts on the outdated Android 6.0.1. Given the high price, this is an absolute no go. This leaves us to hope that the Taiwanese company will amend this soon with an update. At least the ZEN UI 3.0 user interface is appealing, offering a wide range of customisation options and a bunch of other goodies. These include a laser autofocus, which can measure distances to within millimetres, an FM radio, photo and video editing, backup solution, and the Asus Zen-Fit fitness app. All this is completed with the mobile manager, which keeps the battery and storage happy and, on demand, can speed up the system. The Zenfone Zoom S’s double camera launches with two 12-megapixel sensors, a laser autofocus system with phase recognition and object tracking, a dual LED flash, and 2.3x optical zoom. The latter is also the biggest difference to most of the competition’s models, which use wide-angle rather than zoom for the second camera.The camera is easy to use and intuitive. The user can switch between wide-angle and zoom easily using a little button. You can reach the manual mode directly via a separate area too, while the other modes are available via another area. However, the main camera and auto mode disappointed in the test in terms of image quality. The images turned out really blurred around the edges, while straight lines were displayed with a clear seam. This flaw might be removed with a software update later on. Advanced users can get more out of the image quality from the main camera by using manual mode. The zoom camera delivered better image quality in every department during the test, but is understandably not usable for every situation. Remote subjects can be considerably enlarged without a loss in quality, which clearly adds value in everyday life. The ZenFone Zoom S really held its own in poor lighting conditions as well, providing the “Nightscape” mode was activated. 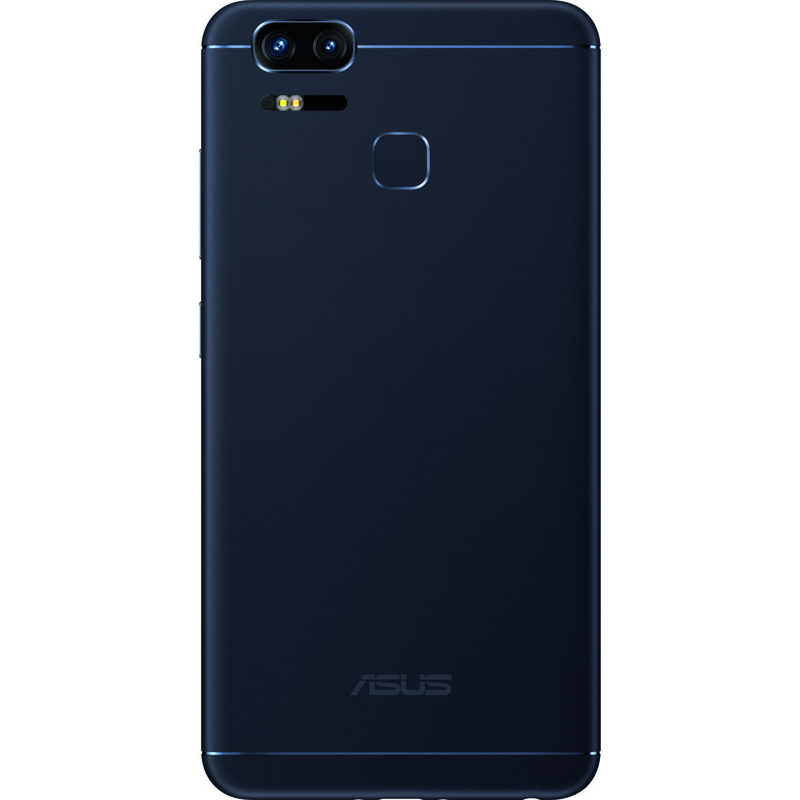 Videos in 4K resolution and a good 13-megapixel camera for selfies round off the photo section for the Asus ZenFone Zoom S.